Powers and Abilities Can take on another person's physical appearance and access the thoughts of any living person they mimic. Vulnerabilities Silver bullet or blade through the heart, decapitation. Appearance Humanoid; can appear as any person they see or come into contact with. Shapeshifting, also known as transformation or transmogrification, is a change in the form or shape of a person, especially a change from human form to animal form or a change in appearance form one person to another. A shapeshifter in a supermarket shows its retinal flare on the security cameras. Shapeshifters can change their form so as to appear as any person living, dead, or fictional. Unlike most monsters, shifters have appeared to have purely human drives that have ranged from jealously, greed and loneliness. It appears that not all the shapeshifters have the exact same abilities: Dean says that the one they encounter in Milwaukee shifts faster than the one they saw in St. Louis. Some must shed their skin, teeth, and nails to change from one form to another. However, Sam and Dean have encountered shapeshifters, such as the Alpha Shapeshifter -- the progenitor of all shapeshifters -- that do not require themselves to shed their skin when they change. Crossbreeding - Shifters are able to have children by impregnating human women. Shapeshifting - As their name suggests, shapeshifters can take on a living person’s physical appearance. Shifters can also take on a deceased or fictional person's physical appearance, from pictures or from film. Telepathy - As long as a shifter keeps their victim alive, they have access the thoughts of the person they are mimicking. Animals sensing the paranormal - Dogs have been shown to react aggressively around the presence of shapeshifters. Decapitation - Like most things, a shifter can be killed by cutting off it's head. Iridium - The rare metal iridium was shown to be the only thing capable of injuring the Alpha Shapeshifter. Retinal flares - Shapeshifters can be identified by the retinal flares they give off on videos. Silver - Piercing the heart with silver will kill a shapeshifter, while general contact with silver can cause them harm. Vamptonite - According to Edgar, the Leviathan food additive has been engineered to kill all monsters, including shifters. A shapeshifter shedding its skin. Shapeshifter!Dean: See, deep down, I’m just jealous. You got friends. You could have a life. Me? I know I’m a freak. And sooner or later, everybody’s gonna leave me. Dean is blamed by the police for the killings committed by the shapeshifter, and even though he is “killed,” this eventually brings him to the attention of Special Agent Victor Henriksen and the FBI. Dean tells detective Sheridan "Oh, yeah. That wasn't me either. That was a shape-shifter creature that only looked like me." A shapeshifter is killing people and taking on their appearances in order to commit robberies. Bank employee Ronald Resnick works out that something not human is behind the crimes. He incorrectly identifies it as a Mandroid, a part-man, part-machine creature that can take on people’s forms. At a bank it intends to rob, the shapeshifter is identified by Sam and Dean based on retinal flare in security footage. They are unable to kill it because Ronald takes the people in the bank hostage, searching for the Mandroid. Sam and Dean take control of the hostage situation, and the creature shifts more than once in an attempt to escape them. It is in the form of Sherri when Dean finally stabs it with a silver letter opener. The real Sherri survives. When Sam and Dean find the corpse of Steve Wandell, and watch video footage of what appears to be Sam killing him. Dean suggests it may be a shapeshifter, but the suggestion is shot down by Sam, because the lack of eye flare or distortion on the video. When Dean arrives at Bobby's doorsteps after being resurrected, Bobby initially believes him to be a shapeshifter. The shapeshifter in 4.05 Monster Movie finds comfort and inspiration in the great Hollywood classic monsters. 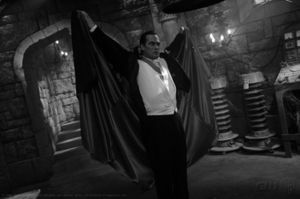 He attacks several victims during the 2008 Oktoberfest celebrations in Canonsburg, Pennsylvania, first as a Dracula-style vampire (his preferred form), then as a Wolf Man and again as a mummy. He is in love with Jamie, who ends up shooting him with silver bullets after he lures her, Dean, and Sam into his basement lair, completely furnished with props and set dressings. Bobby John, a shapeshifter baby. A shapeshifter is imitating men, impregnating their partners, and then returning when the child is six months old to kidnap it. Sam and Dean manage to rescue one baby, which they call Bobby John. While in a market getting supplies, the baby is crying and a woman approaches and offers help. 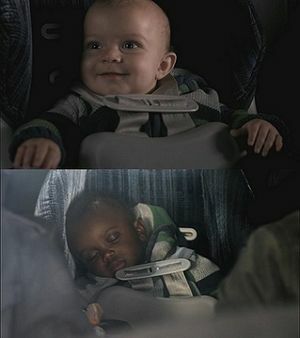 Dean spots retinal flare in her eyes on the security cameras and, while the shifter tries to steal the baby, they manage to get away, only to find out that the baby itself is a shapeshifter when it changes from a Caucasian baby to an African American one based on an image it sees on a pack of diapers. The shifter from the store, now in the guise of a police officer, catches up to them in a motel room, and Sam shoots it through the heart, killing it. They take the baby to the Campbells' compound, where Samuel decides they should raise it themselves. According to Samuel, Christian Campbell and his wife, Arlene, have been trying for a baby. Christian agrees to take in and raise the baby Shapeshifter, but they are then attacked by the Alpha Shapeshifter, who is immune to gunshots, a silver knife in the heart, and elephant tranquilizers. The Alpha kills Mark Campbell, overpowers the others, and takes the child. This shapeshifter seemingly is able to transform just by looking at somebody and can transform in just a few seconds without shedding its skin. Crowley has chained the Alpha Shapeshifter to a chair in his monster prison. It has assumed the form of Crowley's meatsuit, and is not cooperating. The demon keeps demanding that the shapeshifter reveal the location of Purgatory, but the Alpha claims that it doesn't know where to find it. Crowley comments that through experiments conducted on "lesser" shapeshifters, he has found something that will harm the Alpha: iridium. He holds up an iridium knife and threatens to start removing "the parts that stick out" if the shifter does not start talking. The Alpha still denies knowledge of Purgatory, so Crowley stabs it. He then leans in close, and the Alpha spits blood at him. Infuriated, Crowley activates a baby monitor, over which crying can be heard, and reminds the Alpha that he holds several of its children hostage. He threatens to kill them in front of the shapeshifter, but the Alpha replies "Kill 'em all. We'll make more." Crowley turns away, grabs a machete, and beheads the Alpha. Bobby tells Sam and Dean "Shifters, six of them. Two hunters died taking them out." In Grants Pass, Oregon, Sam, Dean, Bobby, and Castiel find Eve experimenting with creating monsters. Her first victim in the town is a young man called Ed Bright. He becomes unwell and reports to a doctor when he has a fever and his skin becomes "gooey." Ed becomes a shapeshifter, and passes this on like an infection to the people he lives with, however most of them appeared to die in process of shapeshifting as they were seen with their skin hanging off their bodies. On examination of a number of corpses in a bar, Dean finds they have strange hybrid attributes - one creature has vampiric teeth in addition to the spike of a wraith protruding from its wrist. Others seem to have shapeshifting abilities on top of these other attributes and display a retinal flare when filmed. Dean dubs these hybrids Jefferson Starships. Irv, talking about Tracey, tells Sam and Dean "we did a shifter job in Sacramento together." While looking for Magnus, Sam captures what appears to be him but turns out to be a shapeshifter from his "collection." Sam kills the shapeshifter with a silver knife. This shifter changes shape without shedding its skin. David: My name is David Lassiter. I'm a shapeshifter. David: We shift... our shape. It's kind of all there in the name. The Lassisters are a family of shapeshifters, one of five monster families that control Chicago. the youngest son David Lassiter left three years previously, desiring to live like a human and not be involved in the family business. The patriarch of the family is dying and Sal Lassiter, the eldest son is killed by a human Irv Sokolowski, seeking revenge for the death of his daughter. The family comes under the control of daughter Margo, who is keen to take control of the city, even if it means war with the other families. 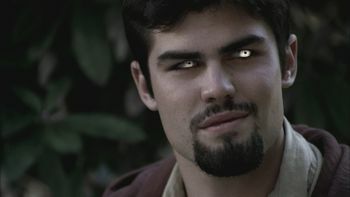 David gets involved with Ennis Ross and the Winchesters in hunting down Irv, who has kidnapped David's ex-girlfriend, werewolf Violet Duval. After Ennis kills Irv, David decides to return to the family. Both David and Sal are seen to be able to shift almost instantaneously, and without shedding skin. Several years ago, Bunny LaCroix had an affair on her husband with a shapeshifter and got pregnant. She passed the baby, Olivia off as her husband Lance's, but when they got home from the hospital, the shapeshifter father was waiting. He killed Lance when he tried to resist and tried to take Olivia, but was killed by Bobby Singer before he could. At the pleading of Bunny, Bobby agreed not to kill Olivia on the condition that Bunny lock her up for everyone's safety. Bunny agreed and asked Bobby to take care of Olivia if anything happened to her. Keeping her word to Bobby, Bunny locked Olivia in her attic, claiming she'd lost the baby and letting only her butler Phillip know the truth. Despite this, she remained devoted to her daughter and Olivia to her. In 2014, Bunny died and Phillip took pity on Olivia and released her, having her disguise herself as the new maid so that she could hide in plain sight. However, Olivia was not content with the state of affairs and took on the form of Bunny to scare the maid Colette when she tried to steal a pearl necklace. However, this resulted in Colette falling to her death. Phillip covered up the murder and hid Colette's body in the attic, claiming she'd gone off to clown college. When Bunny's family arrived for her funeral and will reading as well as Sam and Dean as Bobby's next of kin, Olivia decided to kill everyone, Sam and Dean for revenge against Bobby and the family out of disgust for their greed and the way they treated her mother. She started by taking on the form of Lance and decapitating Stanton. Phillip locked her in the attic again, but Dean released her, not knowing what she really was. Olivia then killed Phillip to pay him back for locking her up and after Dean found her out while she was in Phillip's form, quickly ran off and returned to her own form. After "finding" Phillip's body, Olivia took Sam and Dean to the silverware where they pulled out what they believed to be silver butter knives and gave one to Olivia to test her. As the knives were actually stainless steel, she passed the test. While everyone was distracted, Olivia murdered Detective Howard by drowning him in the toilet and then after Sam and Dean were locked up, confronted the rest of her family with Howard's gun. Olivia explained her connection to Bunny and reasons for killing everyone, but before she could harm anyone else, Sam and Dean escaped by shooting out the lock of the room they were in. Olivia and Sam engaged in a game of cat and mouse, with Olivia explaining Bobby's connection to her family. Olivia quickly realized Sam had no silver bullets as he wasn't firing at her and prepared to kill him. Before she could fire, Dean returned from the Impala with silver bullets and shot her through the heart from behind, killing her. Possibly under the influence of the Mark of Cain, Dean then unloaded several more rounds into Olivia's body. When trying to figure what killed Staci Altman, Dean is given the nanny cam footage of her murder by Dan Harper, which shows him ripping her heart out at the same time he is at dinner with his wife. When Dean shows the footage to Sam, Sam notices what appears to be a eye flare deducing that it is a shapeshifter. Sam and Dean first test the wife, Melissa Harper, who passes. Later when Melissa seeks Sam and Dean's aid while she is being pursued by her dead husband, Dean shoots the doppelganger with silver bullets, which has no effect on him. Sam and Dean eventually learn they are dealing with a qareen. Arthur Ketch and Mary Winchester report to Arthur's superiors that together they have killed eight shapeshifters. Ketch and Mary are interrogating a shapeshifter, who has taken Mary's form, for information on the whereabouts of it's family. The interrogation quickly moves to torture as Ketch begins driving silver spikes into the shifter. 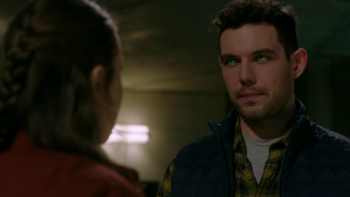 Telling the shifter he will stop torturing him if he just gives up his family, the shifter merely states that Ketch's eye twitches when he lies, prompting Ketch to tell him it always twitches before hitting him, causing the shifter to shapeshift into Ketch's form to taunt him. Dean, Sam and Jack are investigating a case where people are being murdered by their supposedly dead loved ones. After ruling out ghost and revenant activity, the Winchesters and Jack connect the victims who were seeing the same therapist, Mia Vallens. Posing as brothers who had recently lost their mother, the three visit Mia. Sam notices blood on a sign and sneaks upstairs to discover skin, hair, and teeth remains in the bathroom. They accuse Mia of being a shapeshifter and murdering her clients. She admits that she is a shapeshifter but insists that she just wants to help grieving people get closure. After her alibi checks out, she suggests that the killings could be perpetrated by her ex Buddy, who is also a shifter, but with a sadistic streak. 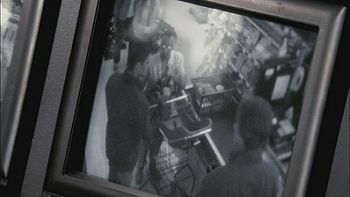 Dean and Jack go to check that Mia’s assistant isn’t really Buddy while Sam stays and reviews security camera footage. Sam recognizes that one of Mia’s patients as Buddy by his retinal flare on the video and borrows Mia's car to check him out. When Dean and Jack return, Jack tells Mia about his mother and asks that she shift so that he can see her. Meanwhile, Buddy has arrived and taken Dean’s form after knocking him unconscious. He incapacitates Jack too and removes his Dean skin. Buddy gives Mia an ultimatum: either she kills Dean and Jack or he will kill her. Sam’s arrival distracts Buddy and he changes plan to try and shoot Sam as he opens the door, but Jack uses his powers to deflect the bullet and slams Buddy into the well. Sam kills Buddy with a silver bullet and the Winchesters and Jack leave Mia who promises to clean up the mess. A shifter reveals itself to Maggie. A shapeshifter kills and replaces a hunter named Tiger and tricks Maggie and the other hunters into leading him to the Bunker. Once there, the shapeshifter purposefully fails to lock the main door and exposes himself to the hunters once the other monsters arrive. During the fight that follows, the shapeshifter disarms Maggie, but mainly watches the fight from the sidelines. Along with the other four monsters, he is disintegrated by Jack after Jack taps into the power of his soul. In its broadest sense, a shapeshifter is a being with the ability to alter its physical appearance. The transformation may be purposeful or not, depending on whether it has been the subject of a curse or spell. Shapeshifters appear in lore from all corners of the world, in Greco-Roman, British, Irish, Norse, Slavic, Asian, and Far Eastern mythology and folklore. They also appear in many horror, fantasy, and science fiction stories today.